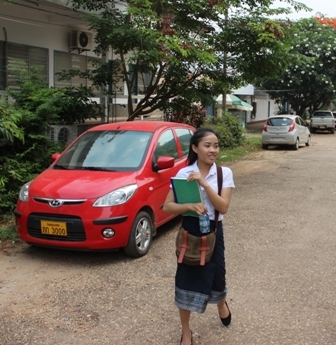 “Moving to Vientiane was not so hard for me,” recalls Aloun Sinxaypanya, who is now in her second year as a student at the National University of Laos. 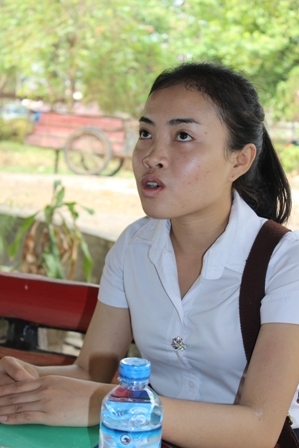 “When I was a child I left my family to go and stay with an aunt so that I could attend the THPC School at Khounkham. So leaving for the big city just seemed like a natura l progression”. Aloun comes from Muang Namxan, not far from Khammouane Province’s famous Konglor cave and about 40 km from the THPC camp at Khounkham. Her parents sent her away so that she could benefit from the education offered there, and Aloun remains grateful that they made this sacrifice for her. “Going to the THPC School enabled me to apply for a university scholarship and that’s how I came to be here,” explains the young woman. “There is no way I could have come to study at the National University without the THPC scholarship. My family might have been able to send me to the local teacher-training college, but even that would have been a struggle”. Aloun is almost halfway through a four-year course in Electronics and Telecommunications, a course she chose on the advice of her parents. “I had no idea what to expect when I started, but I do enjoy the course,” she says. “If I can get through this, I will be confident that I can do anything in the future”. There are more women than men on her course, which she says makes classes more comfortable. Aloun admits that living in the capital city can be a little unnerving at times for a young woman from the countryside. “I think it’s easier for the boys who came from the THPC School”, she says. “As women we have to be careful where we go, especially in the evenings. There are many temptations in the city, many things that us country kids have never seen before”. Aloun keeps reminding herself that she is not in Vientiane to spend money on flashy telephones, clothes and nightclubs. “THPC provide enough money to cover all my expenses as long as I am sensible”, she says. “I even have enough to enroll in a night school to learn English, and when the holidays for both university and English school coincide, I can go home to visit my family”. One of her younger sisters has already left home and gone to live with Aunty – she too has a place in the THPC School. Aloun thinks it would be wonderful if her sister could also get a university scholarship, but says the THPC scholarship is beneficial even for those students that miss it.